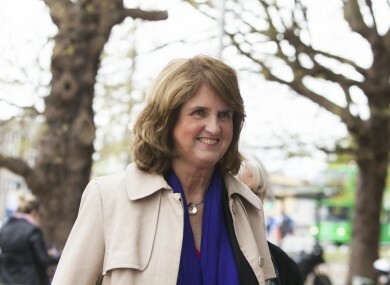 FORMER TÁNAISTE JOAN Burton has denied that she was “relaxed” in the car in which she was allegedly falsely imprisoned during a water charges protest. Burton told the trial of Solidarity TD Paul Murphy and six other water protesters that she suffered nightmares in the wake of the alleged event in November 2014. The jury was today shown several video clips of the protest, including one that appeared to show Burton reading a newspaper article and another in which she told her adviser she should put out a message about the number of children “roaming” around. Murphy (34), together with South Dublin Councillors Kieran Mahon (39) and Michael Murphy (53) and four other men, are charged with falsely imprisoning Burton and her adviser Karen O’Connell by restricting their personal liberty without their consent at Fortunestown Road, Jobstown, Tallaght on 15 November, 2014. The trial has heard Burton was trapped in a car for one hour and a Jeep for a further two hours with O’Connell after they left a graduation ceremony at An Cosán education centre in Tallaght. Under cross-examination from Padraig Dwyer SC, representing Frank Donaghy, Burton was shown phone film clips in which she appeared to be reading a newspaper. In another, she could be heard telling O’Connell that she should put a message on social media describing the number of children who were “roaming” the area. Dwyer put it to Burton that she suggested a message should be put out “to the effect that the children were running wild”. Burton replied, “It was just conversation, to have conversation with Karen”. “Nothing was done about it,” she added. On several occasions, she said she was extremely concerned for the safety of the children present at the protest. Burton also said she was not reading a newspaper, but a page from a newspaper that she found on the floor of the car containing an article about Michael Collins. “To be honest, I read that article,” she said. Laughter broke out in court at this statement, before Dwyer told Burton that whatever Michael Collins might think about the situation was irrelevant. “Well I had a lot of time to reflect,” Burton replied. Burton agreed with Dwyer that this was “completely unacceptable” but said they had been in the car for three hours at that stage and they were “stressed out”. “She’s not a person who uses bad language,” Ms Burton said. In another clip, filmed on Burton’s phone, laughter could be heard inside the car after a suggestion was made that perhaps the car should reverse. Burton conceded that she did laugh at one point when she saw a woman wearing “leopard-print pyjama bottoms”. “Under extreme pressure, people do laugh,” she said. But she rejected Dwyer’s suggestion that the atmosphere inside the car was one of “relaxation, if not some sharing of jokes with O’Connell”. It was not a “fear-filled atmosphere”, Dwyer suggested. “I tried as hard as I could to keep my composure, to keep looking straight ahead, to look as benign and pleasant as possible so as not to aggravate the people who were there even further,” Burton replied. If you show fear, people can smell fear and it can get a lot worse potentially. Dwyer put it to Burton that the conversation recorded in the car did not reflect this. “Are you suggesting I was happy with the events? That is so far from the truth,” Burton said, adding she suffered nightmares in the wake of that day. Earlier she told the court she tried for a long time to avoid thinking about the events of that day because she had “some difficulty” with it. The entire time in the car was not recorded, Burton added. “To be honest, there was a lot of silence in that car,” she said. In another clip filmed outside the car, protesters could be seen surrounding the car shouting slogans including, “Enda Kenny in your ivory tower, this is called people power”, and “Stick your water meters up your arse”. Burton said she considered this last slogan a “human rights issue” rather than a political slogan. She said she did not hear any political slogans except “peaceful protest” and “shame on you”. When asked about one element of the protest that involved a seated protest, Burton told the court that she believed in peaceful protest but “not if it restricts ability of movement”. The cross-examination became heated at times, with Dwyer moved to remind Burton that “This is not the Dail”. Judge Melanie Greally also asked Burton to allow Dwyer to finish his question before answering. When asked why she didn’t hear political slogans, Burton said it was “probably curses and bad language standing out”. “I’m sitting in the back of a car,” she said. I’m cold and I’m hungry and I’m thirsty. I actually asked a guard what would happen if I needed a toilet. My colleague who was sitting beside me was extremely upset and weeping a lot. I was trying to comfort her. “I was listening to statements wishing me dead and so on, illnesses. I heard those maybe because they were more personal. The trial continues before Judge Greally and a jury of seven men and five women. Email “'What would Michael Collins think of this? ': Joan Burton continues Jobstown evidence”. Feedback on “'What would Michael Collins think of this? ': Joan Burton continues Jobstown evidence”.